The Star Wars Universe has bewildered fans for decades. It’s given us a new take on good vs. evil, it’s shown us strange, exotic new worlds, and it’s shown us what life could be like in a galaxy far, far away. Well artist Dave Perillo, like many of us, is a huge fan of Star Wars and he has put his considerable talents to good use and given us a new print that is a must have for fans of the sci-fi classic. 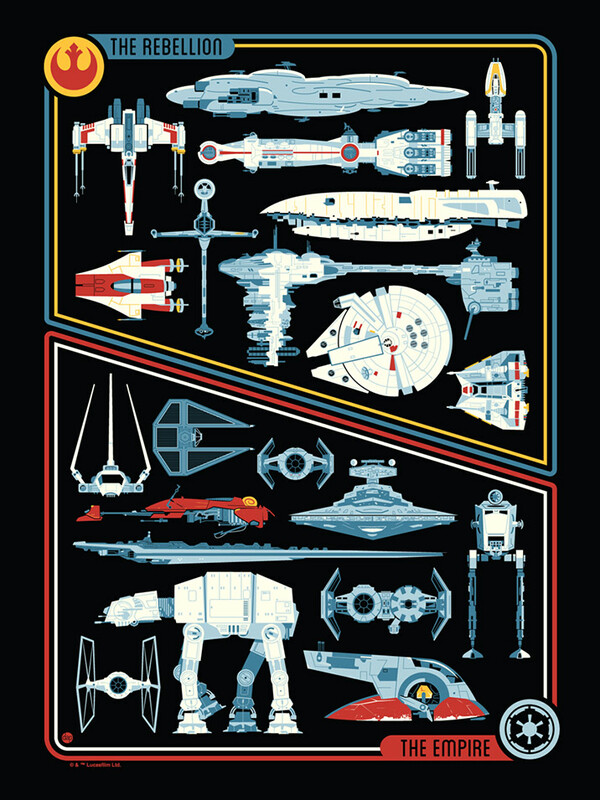 In collaboration with Dark Ink Art and Acme Archives, Dave has just released a new, limited edition screen print entitled, “Transports.” As the title suggests, it gives fans a look at the vehicles of The Rebellion as well as The Empire all in one glorious print. Be sure to follow Dave on TWITTER for updates on new releases and go check out his OFFICIAL BLOG to get more insight to what he has going on. This entry was posted in Art, Movies, Pop Culture, Posters, Science Fiction, Star Wars and tagged Acme Archives, Dark Ink Art, Dave Perillo, science fiction, Spaceships, Star Wars, The Empire, The Rebellion, Transports. Bookmark the permalink.